Millions of classic images, free online. Kalev Leetaru has uploaded a searchable database of 12 million historical copyright-free images to Flickr. Most of the images that are in the books are not in any of the art galleries of the world – the original copies have long ago been lost. The pictures range from 1500 to 1922, when copyright restrictions kick in. Even big brother thinks big brother can be dangerous. mass retention of data to aid surveillance was “neither necessary nor proportionate”. 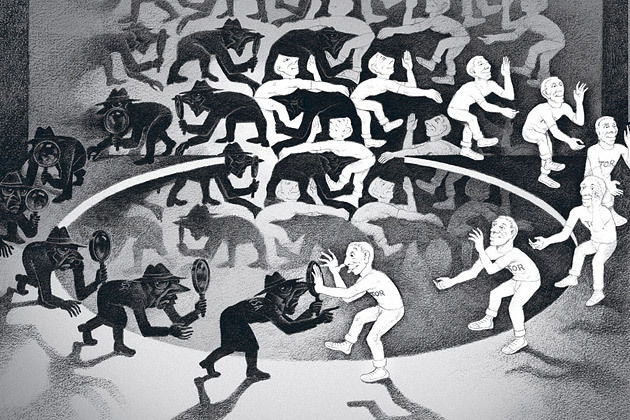 a lack of transparency about the reasons governments approve or start large-scale monitoring of what people do online. It’s what we’ve thought for a long time and refreshing to see someone, even if one of our “big brothers”, owning up. It looks spookily like the kind of oversight envisioned in futuristic tales like Nineteen Eight-four or Brazil. The report said measures to force net companies, mobile operators and others to retain data on what people did online and whom they talked to had little justification. Gathering data curbs privacy because there are too few limits on who could look at the data and what it could be used for. Big brother, and every hacker, is watch YOU! If you’re using an older OpenSSL version, you’re safe. A bug in software used by millions of web servers could have exposed anyone visiting sites they hosted to spying and eavesdropping, say researchers. Because we’ve an addict in the house (he keeps it under control), I happened to notice the report that Minecraft went offline while servers were patched. 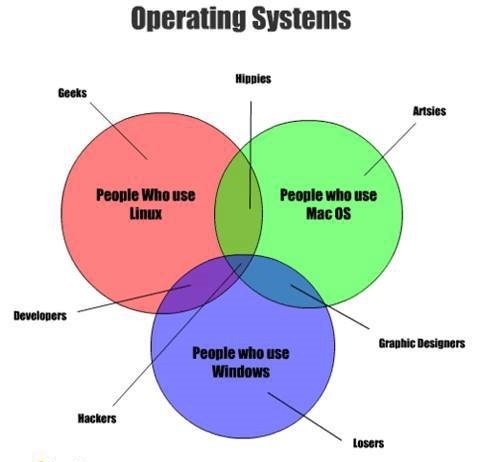 A guide to operating system users. What’s your operating system? See the pie-chart below for insight. Humour from GraphJam.com. Anyway, what is an operating system? It’s the boss. Most ordinary computer users take their operating system for granted. The easiest way to understand what an operating system does is to take a close look at what computers were like before operating systems were invented. The earliest electronic computers did not have any operating system. If the user wanted to change what the computer was doing, the user had to open the back panel on the (then very large) computer, and change how the wires were connected. Changing what the computer did was very time consuming and required an expert. Later, computer scientists decided to have the wires stay as they were, and feed instructions to the computer with punch cards (cards with holes that represented instructions) or magnetic tape. The computer would store the instructions in some kind of memory. This way of operating a computer is called the von Neumann architecture. Still, computers of the time generally only had enough memory to “remember” one program at a time. If the user wanted the computer to run a different program, the user had to wipe out the first program from memory and then load another program into memory. Computer operators and computer scientists grew tired of carrying around large stacks of punch cards. They also wanted computers to run more than one program at a time. As years of work changed or replaced computers to have more memory, computer operators and computer scientists decided that some computers could hold several programs in its memory. The computer user could then simply choose which program the user wanted to run. Running a computer this way requires a “boss” program that controls all the other programs, and asks the user what program the user wants to run. Such a boss program is called an operating system. Having several programs in memory that can be run at any time makes some new problems. The operating system itself has to remember where the programs are at in memory. The operating system also has to prevent two programs from fighting over which one gets to use the processor. Modern desktop computers need an operating system. Operating systems generally start up automatically when the user turns on the computer. Mozilla, the power behind Firefox, launches a $25 smartphone. Mozilla’s smartphone operating system, Firefox OS, is being installed on mobile phones made by its partners, like Alcatel, Huawei, LG and ZTE, which will retail for $25 and be targeting fast growing emerging markets where users are unwilling or unable to be tied in to long term contracts. Their Firefox OS phones will give multimedia capabilities on a pay as you go account. As for Firefox OS, I like the idea of being able to operate a mobile device without Android, i.e. without Google knowing everything I do. It looks like Firefox OS will capture market share as quickly as Firefox browser did, as the FOS captured 7% of developer mindshare in just six months. Firefox OS phones will be on sale this year. It’s not that you want to be a spy, it’s not that you want to hide under a rock, it’s just that you feel threatened by the invasiveness of data tracking by Big Co (eg Google, Microsoft, Facebook etc) and Big Brother (the government and banks know more about you than you know about yourself). So Bloomberg’s report: The Inside Story of Tor, the Best Internet Anonymity Tool the Government Ever Built led to option of installing a browser which behaves as a browser used to: It lets you look at the internet, without the internet looking at you. Check out Tor here. In any case, you should use an anonymous search engine, like DuckDuckGo or IXquick, which are excellent. Checkout PrinterKnowledge if you’re having trouble. It could save you time and money. How embarrassing! I knew it, but forgot it. But luckily was reminded yesterday that Yahoo doesn’t offer search any more. In mid-2009 Yahoo gave up on search and contracted with Bing to supply teh service. I was reminded when I saw the confession at the bottom of a Yahoo search page. Further investigation reminded me that Microsoft now runs Yahoo search. Yahoo keeps 88% of the revenue on ads that appear on Yahoo sites, but Microsoft gets the data on computer users’ online search and buying habits. Microsoft lost its morality long ago so there’s no doubt that the data acquisition is as insidious as Google’s. So immediately the Yahoo search box was removed from our site and replaced with a private search engine IxQuick, and also replaced the default search engine in my browsers. Fortunately there’s and add-on for Firefox and Seamonkey to do that. You could also put a scraper on your browser like scroogle, which removes personal info from searches. Users have been persuaded that if the search engine knows your history it will deliver better results, but that is unlikely. If you are searching for something teh terms you use and teh popularity of sites in aggregate are more important that you personal preferences, especially for more unusual searches. For example, if you usually browse entertainment sites, but then do a search on construction technology, you want results for construction technology, not results that are biaised by entertainment preferences. Google, Bing and others want your search history to sell you stuff which you are not even looking for (since that was not the purpose of your search). Don’t get scroogled, just search. Go to another engine like ixquick.com, search.com, dogpile.com, webcrawler.com, duckduckgo.com or put a scraper on your browser. As a user of OpenSuse for a decade or so, I’m obviously a fan. The recent release received a good review from Muktware: An OS for Grownups. It’s a good choice for office productivity, although we also do video editing etc with it. Download your copy here. You can get a Live version to run off a USB, or get the full distro on a DVD version. David Webb recently published a review of bit coin written with a non-technical perspective. It is a useful insight and suggests that maybe bitcoin is not the currency of the future, though it is interesting. Have a look at The hole in Bitcoin here.